On February 1, 1968, two underpaid sanitation workers died a gruesome death in Memphis when they were swallowed alive by a poorly maintained garbage packer. In his book, The Plot to Kill King: The Truth Behind the Assassination of Martin Luther King, Jr., Dr. William Pepper claims the deaths were not an accident. Instead, he argues, they were part of a ploy to get Dr. Martin Luther King, Jr. to return to Memphis so he could be murdered. Pepper believes this alleged plan, which he says was hatched by the Dixie Mafia family of Russell Adkins in coordination with Memphis Director of Police and Fire Frank Holloman, led to the assassination of King 50 years ago this week. To anybody who only knows King from current history books as a celebrated and revered civil rights leaders, it would seem odd that there were forces high in the US government who wanted to see him dead at the time. Those who lived during that era of strife, however, know firsthand of the animosity King faced at every turn. His life was in danger every step he took on that long march toward equality in the US. The list of those who wanted to see King dead was probably as long as his accomplishments. In the end, however, his assassination, like several others of that turbulent decade, was ascribed to a lone gunman, James Earl Ray. But skeptics, including King’s own family and the jurors of a 1999 civil court case in Memphis, have questioned that explanation for five decades. For that narrative may shield a darker, more disturbing truth about King’s assassination — that he threatened a racial and economic power structure that was capable of going to great lengths to silence him. MLK had faced opposition at both a local and national level. Not only was he in constant danger from local KKK and white-power groups, but he was under close FBI surveillance. It was well known that FBI Director J. Edgar Hoover hated him. The bureau had informants inside the civil rights movement, and even went so far as to send King an anonymous blackmail letter trying to convince him to commit suicide. Lawyer and author, William Pepper, was a friend of King’s, and later represented the convicted assassin James Earl Ray. No one knows more about the events and evidence surrounding King’s death than Pepper, and after decades of investigation, he has concluded that Ray was framed by a power nexus of the FBI, the CIA, the military, the Memphis police, and organized crime figures from New Orleans and Memphis. Below is the first chapter from his book The Plot to Kill King: The Truth Behind the Assassination of Martin Luther King, Jr. (Skyhorse Publishing, January 16, 2018). And then, ignore the rain. Beginning in February 1968, Dr. King had received regular reports from his friend, Memphis clergyman James Lawson, pastor of Centenary Methodist Church, about the sanitation workers dispute in the city. Ninety percent of the thirteen hundred sanitation workers in Memphis were black. They had no organization, union or otherwise, to defend their interests and no effective means to air grievances or to seek redress. However, to most of the citizens of Memphis, black and white, a strike against the city was nothing less than rebellion. In a bitter and frustrating setback for the black community, Henry Loeb, who had been the mayor from 1960 to 1963, retuned and defeated incumbent William Ingram, who was regarded as friendly to black Memphians, in the mayoral election. Considering the new mayor’s history and reputation, there was no reason for black workers to hope that their working conditions or salaries might improve. The grievances were many. Salaries were at rock bottom, with no chance of increase. Men were often sent home arbitrarily, losing pay. Much of the equipment was antiquated and poorly maintained. In early 1968 two workers, thirty-five-year-old Echole Cole and twenty-nine-year-old Robert Walker were literally swallowed by a malfunctioning “garbage packer” truck. We would later learn this was a planned murder by the Dixie Mafia family of Russell Adkins, in coordination with Memphis Police Department Director of Police and Fire Frank Holloman, in order to compel Dr. King to return to support the strikers. There was no workmen’s compensation and neither man had life insurance. The city gave each of the families a month’s pay and $500 toward funeral expenses. Mayor Loeb said that this was a moral but not a legal necessity. After the deaths of Cole and Walker, talk of a strike was widespread. Maynard Stiles, who was second-in-command at the Memphis Public Works Department, told me years after the event that T. O. Jones, the head of the local union, called him the night before the strike with what Stiles regarded as a very reasonable list of demands. Stiles said that Jones wanted him to go to the union meeting scheduled for that night and announce the city’s agreement with the terms. An elated Stiles called Loeb to advise him that a settlement was at hand on very reasonable terms. Loeb ordered him not to dignify any such meeting with his presence and insisted that no terms be accepted under any circumstances. The union meeting went ahead that evening without Stiles. The next day the strike was on. The national office of the American Federation of State, County and Municipal Employees (AFSCME) sent in professional staff to handle the negotiations, which the mayor insisted on conducting in public, giving neither side any opportunity to change position. With no solution in sight, an interdenominational group of clergy intervened but made no progress. The deadlock led to a protest march on February 23, which got out of control in the face of heavy police provocation. Ultimately, the police used Mace on men, women, and children marchers and bystanders. Afterward, a strike strategy committee was formed with the Reverend James Lawson as its chairman. Reverend Lawson had been one of the founders of the Southern Christian Leadership Conference (SCLC) and had worked with the organization for a decade. Dr. King regarded him highly and he was Dr. King’s best friend in Memphis. Meanwhile, Dr. King was closing a leadership conference in Miami. While knowing that most of his audience disagreed with the Poor People’s Campaign, he insisted that the nation had to be awakened to the issues of poverty and hunger. The shantytown he planned to erect in Washington would ensure that the plight of the American poor would be foremost in the consciousness of the people of the nation, even the world. “We are Christian ministers and … we are God’s sanitation workers, working to clear up the snow of despair and poverty and hatred….” he told them. 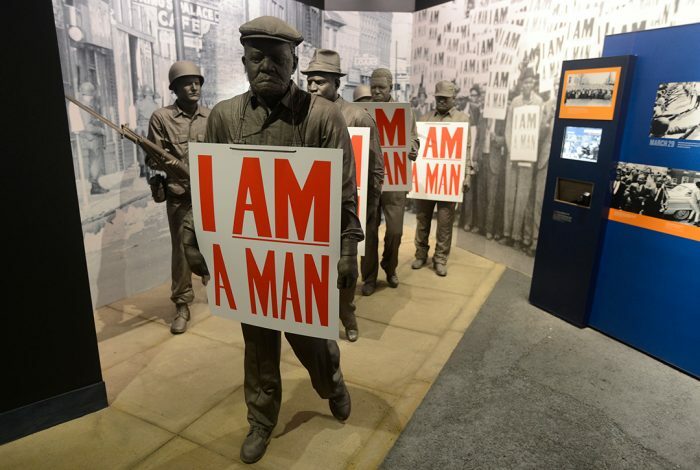 In Memphis, a city injunction against the strike intensified the black community’s support for the sanitation workers, and consumer boycotts and daily marches through the downtown areas were organized. The director of the Memphis police and fire departments, Frank Holloman, who had agreed that he would allow the marches if they were peaceful, withdrew many of the visible, uniformed police. Holloman had been a special agent of the FBI for twenty-five years. For seven of those years (1952–1959), he had been in charge of Director Hoover’s Washington office. In Memphis he had no support from the black leaders. Internally he relied heavily on his chief, J. C. MacDonald (who in 1968 was close to retirement), a group of seven assistant chiefs, and Inspector Sam Evans (who was in charge of all special services), and Lieutenant Eli H. Arkin of the police department’s intelligence bureau. The growing involvement of young blacks, particularly high school students who were being organized by the Invaders and their parallel organization, the Black Organizing Project (BOP), brought increased volatility to the strike. During a boycott of the local merchants, these young people harassed blacks who made purchases in downtown stores. The militants made themselves heard throughout the dispute; various Invaders were arrested for disorderly conduct for trying to persuade students to leave school and for blocking traffic. In retrospect, the Invaders’ actions seem mild in comparison with those of black power groups in other parts of the country. I interviewed each of the members of the Invaders. 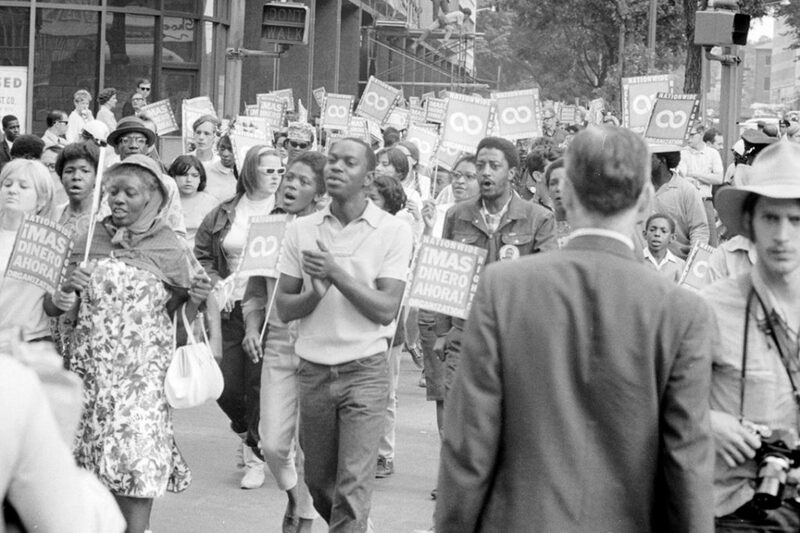 Community on the Move for Equality (COME), a coalition of labor and civil rights groups spearheaded by an internal committee of local clergy that was now running the strike, sought national as well as local publicity, scheduling nationally prominent leaders to speak in Memphis in support of the workers. The local NAACP chapter asked Roy Wilkins to come; the local union sought to bring in longtime civil rights leader Bayard Rustin; and Reverend Lawson raised the possibility of bringing Dr. King to Memphis. Wilkins and Rustin finally agreed to come on March 14. Lawson, who had been keeping Dr. King abreast of developments, approached him in late February when the civil rights leader was close to physical exhaustion. It was around this time that his doctor had ordered complete rest. At first, Dr. King had been reluctant to become directly involved. He had delivered speeches in Memphis but had never headed any civil rights activity there aside from leading the so-called “march against fear,” which was organized in response to the Mississippi shooting of James Meredith, the first black to enroll at the University of Mississippi. But even though some SCLC executive staff wanted to stay away from the strike, Dr. King came to see it as being directly relevant to the national campaign. What group could be more illustrative of the exploitation he sought to dramatize than these lowliest nonunion workers who daily removed the garbage from the city’s homes? Dr. King’s involvement was potentially a high-profile activity (though with some risks) that would lead naturally into the Washington Poor People’s Campaign. Because Memphis contained a small, militant, black organizing group (the Invaders) as well as the more conservative southern black congregations, it was in his view a microcosm of the nation, with all of the attendant problems and obstacles to the development of a successful coalition. How could he turn his back on the real, current struggle of the Memphis sanitation workers? In early March Reverend Lawson made the announcement that the city had been waiting for. The SCLC had transferred a March 18 staff meeting scheduled for Clarksdale, Mississippi, to Memphis, and on that evening Dr. King would address a gathering of strike supporters. Although Dr. King had experienced problems and setbacks, particularly concerning his position against the war, no one approached his signature on the national scene as a spokesman of the black and poor of America. His involvement would inevitably focus national attention on the strike, its issues, and its nonviolent tactics. When Dr. King advocated a general work stoppage in Memphis, the temple from where he was addressing nearly burst into pandemonium. He sat down to tumultuous applause and then received a note, initialed by Andy Young and Ralph Abernathy, suggesting that he return to lead a march on the day scheduled for the work stoppage. Dr. King returned to the microphone and said that perhaps the Poor People’s Campaign could begin in Memphis. If the people wanted him to, he would lead such a march to city hall. The response was predictable. The date was set for March 22, four days later. Organizers began to spread the word that Dr. King would return to Memphis to lead a march on Friday from Clayborn Temple to city hall. Ten thousand marchers were expected. White apprehension rose. Hate literature was circulated throughout the city. Incredibly, the day before the march, the city (whose average annual snowfall was only 5.6 inches) was buried by a blizzard that dumped 16.2 inches of snow, the second-largest snowfall ever recorded in Memphis. The city was virtually shut down and the march had to be postponed until Thursday, March 28. Early on the morning of the march, Dr. King left New York City for Memphis. Organizers began to intercept students on the way to school or even at the school gates, urging them to join the march. A confrontation between police and students at Hamilton High School resulted in a student being injured. Word spread that the police had killed a girl at the school, and young people’s anger grew. It was not an auspicious start for Dr. King’s nonviolent march. The Memphis Police Department (MPD) was completely mobilized that morning, with over three hundred officers supplemented by fifty sheriff’s deputies committed to the general march area. Emergency mobile TACT units run by Inspector Sam Evans were also standing by. Each unit consisted of twelve sheriff’s deputies and MPD officers with three cars and four men to each car. This was the first use of a TACT squad in Memphis. Since there weren’t enough shotguns to go around, a number of officers carried personal weapons. The police were anxious. Riot training had been virtually nonexistent in Memphis except for a special, elite group. Their own constantly circling helicopter only added to the uneasiness. Dr. King was late and the crowd became increasingly restless. Some leaders, such as the Reverend Samuel “Billy” Kyles, wanted to start the march without Dr. King, but Reverend Lawson insisted on waiting. For a long time Lawson had tried to involve Kyles in the strike-support planning sessions but finally agreed with the others that it was a waste of time. Kyles never showed up, although he frequently attended the public meetings. Dr. King and Ralph Abernathy finally arrived at the march site just before 11:00 a.m., having been driven directly from the airport. They led the march, linking arms with local ministers, but signs of unrest were everywhere. Trouble began in short order as the march line proceeded up Beale Street to Main Street. The sounds of glass breaking, isolated at first, became louder and more frequent. Youth ran alongside the march line, ignoring the marshals’ instructions. Chaos descended, and Dr. King was persuaded to leave the area. A car was flagged down and he was taken to the Rivermont Hotel at the direction of the police, being escorted by motorcycle officer Lieutenant Marion Nicholas. Lodging was provided even though he had no reservation at the hotel (rooms having been reserved at the Peabody Hotel). After Dr. King had been spirited away, Lawson moved through the march line with a bullhorn, urging everyone to return to the starting point, the church. As thousands began to turn around, the sounds of breaking glass continued. Youth darted from one store to another, shattering windows. Some began looting, but eyewitnesses maintain that they were followed by older, more experienced hands who quickly and efficiently took advantage of the window-breaking, entered the stores, and came away with goods. The police moved in behind the disorganized crowd and fired Mace and teargas. Around 11:30 a.m. Frank Holloman and Mayor Loeb called Governor Buford Ellington and requested the Tennessee National Guard. By noon, a contingent of the State Highway Patrol was on the way to Memphis and the first National Guard units were assembling. The police and the sheriff’s officers randomly clubbed a number of onlookers and customers of stores, pool halls, restaurants, and lounges, which under the order of Inspector Sam Evans were forcibly closed. A sixteen-year-old boy, Larry Payne, was shot and killed by the police, who claimed he was a looter and when cornered had pulled a knife. An eyewitness said that Payne had his hands up when shot. A knife was allegedly found at the scene, but no fingerprints were on it. That evening, a curfew was put in place and Guardsmen from all over western Tennessee, accompanied by eight armored personnel carriers, descended on the city. By Friday morning, 282 persons had been arrested and held without bond; sixty-four persons were treated in hospital emergency rooms by midnight Thursday, with another ten coming in over the weekend. Dr. King was savagely attacked by the media and the Washington establishment. Congressmen tripped over each other in their haste to condemn him and to demand that on the basis of the Memphis experience the Poor People’s Campaign in Washington be called off. Dr. King’s SCLC aides, who’d had no hand in planning the march, believed that local incompetence had set up this disaster. Reverend Lawson believed that the young militants, who hadn’t been involved in planning the march either, would have to be brought in with the SCLC. Dr. King met, against Abernathy’s advice, with three leaders of the Invaders who would be fully involved in the planning and development of strategy for the next one. Though depressed over the violence, Dr. King was buoyed by the meeting. At an afternoon press conference he expressed confidence in the new working relationship. He also confirmed that he would take time out from his schedule to prepare for the Washington campaign, and once again return to Memphis to lead a large nonviolent march. This time the SCLC would assist in the planning. Meanwhile, the boycott and local marches would continue. Nonviolence was still seen as the only viable strategy. The following Saturday, March 30, SCLC staff and some board members met in Atlanta to discuss whether to continue in Memphis. Ralph Abernathy told me that Dr. King privately had made the decision to march again in Memphis, but understandably he wanted the SCLC’s support. Finally Dr. King obtained the support he wanted. The decision to return became official on Saturday afternoon, March 30, 1968. On March 31, in an act that I long regarded as unrelated to the events of this story, Lyndon Johnson announced before a nationwide radio and television audience that he wouldn’t seek reelection. Fifteen days earlier Robert Kennedy had announced his intention to challenge Johnson for the presidency. I would learn years later that FBI Director Hoover had informed Johnson around that time that Kennedy had been attempting to reach Dr. King to advise him of his decision. Kennedy was seeking Dr. King’s support and participation in what promised to be a difficult and bitter campaign. SCLC organizers — including James Bevel, James Orange, and Jesse Jackson — went ahead to Memphis to take over the arrangements for the march, the date of which was firmly set for April 5. Six thousand union members from all over the country were to come to Memphis. One after another, labor and civil rights groups announced their support. On Monday, April 1, Mayor Loeb announced an end of the curfew, and units of the National Guard slowly began to leave, ready to be called up quickly if needed for the next march. The funeral for Larry Payne, the sixteen-year-old casualty of the first march, was held at the Clayborn Temple the next day, followed by a speech by Ralph Abernathy that evening to an overflowing crowd. 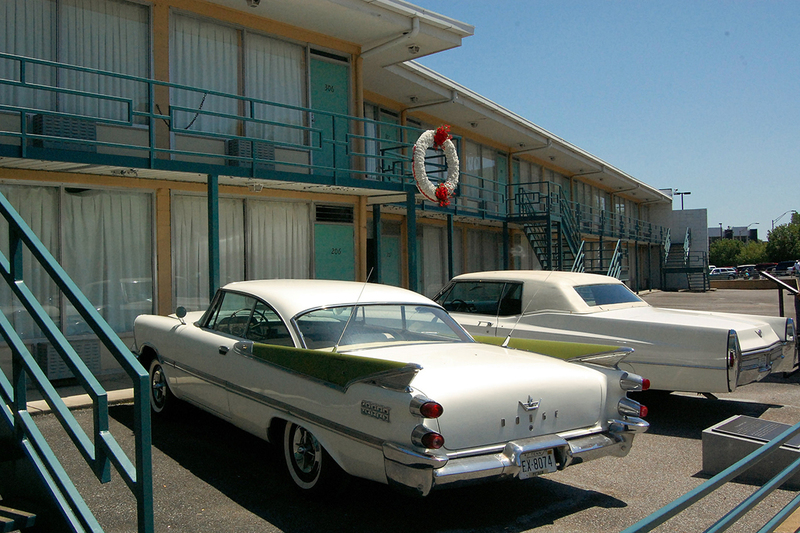 He checked in at the Peabody that evening, but the next day would transfer to the Lorraine Motel when Dr. King arrived. Wednesday morning, City Attorney Frank Gianotti appeared in US District Court before Judge Bailey Brown and requested a temporary restraining order against certain named out-of-state residents (King; Abernathy; Hosea Williams, the chief community organizer; James Bevel; James Orange; and Dr. King’s bodyguard, Bernard Lee) to prevent them “from organizing in or engaging in a nuisance parade or march in the city of Memphis.” Judge Brown issued the restraining order but set it down for a hearing the next morning. Dr. King’s flight arrived in Memphis at 10:30 a.m., having been delayed by a bomb threat. His party was picked up and taken straight to the Lorraine Motel. After checking in, they went to the Reverend Lawson’s church to meet with clergy and union leaders and with a set of lawyers. They adjourned to the Lorraine Motel to eat in the restaurant and meet with the BOP group around 4:00 p.m. At the meeting, Dr. King agreed to assist in the funding of a black cooperative and a “liberation” school. The Lorraine, today the National Civil Rights Museum, is a two-story building at 406 Mulberry Street, located in rundown warehouse- and rooming-house area of the city, five blocks south of Beale Street and a block east of South Main Street. It had been black-owned and -operated from its beginning. Walter and Lorraine “Lurlee” Bailey took it over in 1955 when it was a fourteen-room structure. By 1965 it had nearly fifty new units and a swimming pool. It was a family-run motel, with Bailey and his wife doing most of the work and cooking. Checking in with the SCLC advance staff on April 2 were James Laue of the Justice Department’s Community Relations Service (room 308) and photographer Joseph Louw, who had been traveling with Dr. King while working on a documentary about the Poor People’s Campaign (room 309). Dr. King, initially scheduled to occupy the secure room 201, was scheduled to address a mass meeting at the Masonic Temple and, in spite of a storm, several thousand people were expected. Ralph Abernathy told me that Dr. King was tired and wanted to stay at the motel and meet and talk to a few people. As he had done the night before, he asked Ralph Abernathy to stand in for him and address the group. Tornado warnings had been issued. The storms swept out of Arkansas and across Tennessee and Kentucky, leveling houses, barns, utility lines, and trees. Twelve people were left dead and more than one hundred were injured. The wail of civil defense sirens sounded across the city, adding to the eerie and expectant atmosphere inside the Masonic Temple. Dr. King arrived around 9:00 p.m. to rapturous applause. And He’s allowed me to go up to the mountain and I’ve looked over and I’ve seen the Promised Land. But I want you to know tonight. THAT WE AS PEOPLE WILL GET TO THE PROMISED LAND. I’m not worried about anything; I’m not fearing any man. Related front page panorama photo credit: Adapted by WhoWhatWhy from I Am Man (Amaury Laporte / Flickr – CC BY-NC 2.0), James Earl Ray (FBI), and MLK (National Archives / Wikimedia).